Hostel Van Gogh, Amsterdam, Holandia : Rezerwuj teraz! This modern youth accomodation is one of the best in Amsterdam Centre!! 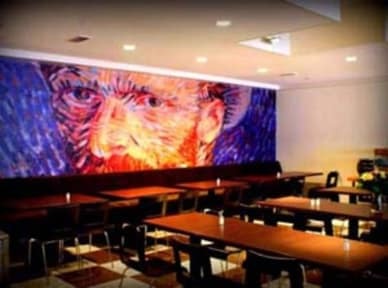 Hostel Van Gogh is situated in the best spot in Amsterdam centre, the most vibrant centre for art, fashion and culture, with three major world famous museum just at your doorstep: Van Gogh Museum, the Rijksmuseum and the Stedelijk Art Museum. Please note; our single rooms are with one bed and we can only accept one person for those bookings. We will not accept more than one person to be in single rooms. For several individual bookings with different arrival date , and want stay in same room, due to nature of business, we wont make arrangement for your request . You have option to book a private room if that important for you ! From the hostel, you can reach the numerous bars, shops, clubs and other sights of the city very easily. If you like exciting nightlife, the entertainment zone Leidseplein is just five minutes' walking distance, where the famous clubs 'Paradiso', 'Melkweg', 'Jimmy Woo', or the recently renovated theatre 'DeLaMar' can be found. There is no curfew. From January 2019, the new city tax will be 7% to be paid upon check-in. VAT (9%) is included. The total amount of your reservation needs to be paid upon check-in. To ensure everyone's comfort, Please note that there is an age restriction ( 18 - 40 yo only ) for the mixed dorms . please book private room if you are not in this age range! We do not accept any party groups, including bachelor or hen party groups! These groups will be refused at check in!!! Reception for the hostel shared dorm rooms closes at 12:00 mid-night. If you are booking dorm beds and plan to arrive after this time, we cannot accomodate you. 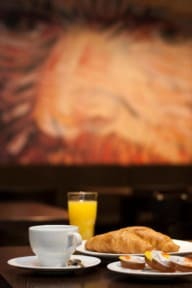 If you booked a private room, please check in at Van Gogh hotel reception, the desk is open 24 hours. This hostel does not have a private bike parking, and bikes are not allowed to carry into hostel ! Please see our Things to Note below before booking. Place and staff absolutely great. Single room was perfect for short stay. Plus air condition which was functioning without any problems. Whole place/room is clean as it can be. PThere's possibility I will back.